Paul tells the police about the bone. Lucy is sure she'll need to be interviewed and wonders if Mrs Mangel really did kill Len! Jane tells Helen about Charlene's dress and says Charlene no longer wants to go shopping. As Helen leaves Paul tells her not to forget about tonight as it's going to be ‘one dinner party'! Gail tells Rob to be home early as the Robinsons are coming to dinner. She tells him she's got his good suit ready for him and tells him not to be late. Rob is sure she's planning something. Jane returns home to find Mrs Mangel sitting alone. She says she's trying to come to terms with her memory loss. Jane tells her not to worry, as her memory will return soon. Mrs Mangel confronts Jane and says she knows she's been keeping something from her as she's seen Len's clothes are missing from his wardrobe. Mrs Mangel asks a number questions about Len's departure, all of which Jane answers until Mrs Mangel asks if Len died peacefully? Wondering what her options are Jane tells her Len died very suddenly. Helen arrives and has brought some groceries. Mrs Mangel doesn't remember Helen and Helen says she's sorry about her accident. 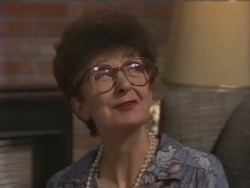 Mrs Mangel tells Helen she's just found about Len and Helen says it's a shame she's had to go through that pain again. Jim is trying to iron his shirt. He and Helen wonder why they have to dress up so much just for dinner at Gail's. Jim hopes Paul and Gail have finalised plans for the wedding. Jim tells Helen that Scott is going back to school on Monday. 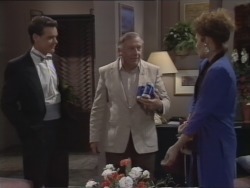 Jane arrives and tells Daphne and Mike that Mrs Mangel has come to the conclusion that Len is dead. Jane thinks she will be able to cope with that better than knowing Len left her for another woman. Daphne says she will pass the word around so that no one puts their foot in it. Paul and Gail are dressed up to the nines. Paul tells Gail she looks lovely and she returns the compliment. The house is decorated with flowers and champagne is on ice. Rob arrives home and insists Gail is hiding something from him. The Robinsons arrive at the same time as Mr Downley. 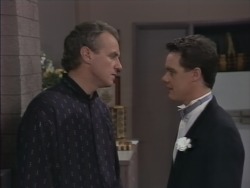 Paul tells everyone he and Gail have invited them here under false pretences; Mr Downley is a wedding registrar and the reason they are here is to witness Paul and Gail's wedding! Cue shocked faces. Paul and Gail are pronounced man and wife and Paul is told to kiss the bride. He pecks Gail on the cheek, but Rob eggs him on and tells him he has to ‘give the little Mrs a proper kiss'. So Paul obliges and he and Gail share a kiss. When they break apart Gail wipes her lipstick from Paul's mouth and they smile at each other knowingly. Rob congratulates Paul and thanks him for the impromptu wedding – it has saved him a mint! 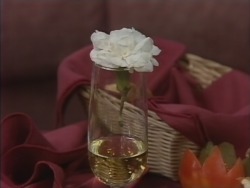 Helen takes a flower from the vase and places it in Paul's buttonhole. She quietly asks him why he didn't tell them about the wedding. 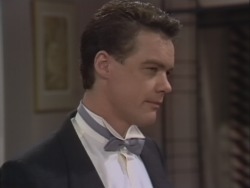 Jim takes Paul aside for a word and tells him how disappointed the rest of the family will be. Paul says he and Gail wanted a small affair and they didn't want to take the limelight from Scott and Charlene. Lucy goes to bed leaving Helen, Jim and Scott to discuss the wedding. None of them can believe it and Jim is worried about Julie and Hilary's reactions. Helen says it might not have been a very positive beginning but she hopes they are happy. Rob is leaving to move into Lassiters. 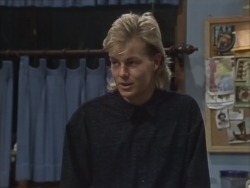 He gives Paul and Gail his congratulations and tells Paul to look after his little girl. Paul puts the cases in the car and Rob asks Gail if she's really over Jeremy. She tells him her marrying Paul has nothing to do with Jeremy. Rob leaves and Paul asks Gail if she wants to finish of the champagne. Gail says she's tired and wants to go to bed, she tells Paul she's made up the spare bed for him. As she goes upstairs Paul takes the flower from his suit and places in Gail's champagne glass, wishing himself a happy honeymoon.